A graphene-based sensor for high-resolution thermal imaging with record high sensitivity for thermal detection has been presented by researchers a group of researchers at the Cambridge Graphene Centre. The team created a sensor capable of detecting temperature changes down to 15 μK. 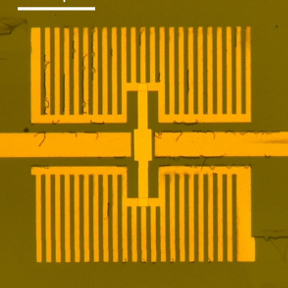 The graphene-based pyroelectric bolometers consist of a pyroelectric substrate, with a conductive channel of single-layer graphene and a floating gate electrode placed on top. Graphene does not require external transistor amplifiers which are necessary in typical pyroelectric thermal detectors. This is because graphene acts as a built-in amplifier for the pyroelectric signal. “We can build the amplifier directly on the pyroelectric material. So, all the charge that it develops goes to the amplifier. There is nothing lost along the way,” said Dr Alan Colli (Emberion), co-author of the work. Another advantage of using graphene is its combination of high conductivity and strong field effect. A high-performance graphene IR detector is also capable of offering an excellent signal with a relatively low level of incident radiation, making it possible to isolate different parts of the IR spectrum. “With a higher sensitivity detector, then you can restrict the band and still form an image just by using photons in a very narrow spectral range, and you can do multi-spectral IR imaging. For security screening, there are specific signatures that materials emit or absorb in narrow bands. So, you want a detector that’s trained in that narrow band. This can be useful while looking for explosives, hazardous substances, or anything of the sort,” Colli added.